When my daughter was a baby, she was constantly trying to jump. She jumped up and down on my lap, she jumped on the floor as I supported her and she jumped in her doorway jumper. The doorway jumper is made up of a seat suspended from straps that attach to a bungie like cable. At the top of the elastic cable is a clamp that fastens to your door frame. This article provides everything you need to know about doorway jumpers for babies, as well as five reviews that will help you select the best doorway jumper for baby. Weight Limit– It is important to note that all jumpers come with a weight limit for safety and warranty protection. Seat- While comfort is a relative term, you should always ask yourself this question when choosing the best doorway jumper for baby – is the seat comfortable? Additionally, you should go with one whose cushions are removable and machine washable. Toy Attachments- Sometimes more is less. A few toys will be enough. Remember, the adventurous world our kids live in does not call for anything that doesn’t add fun to it. How Packable It Is– Your best choice of a doorway jumper should be one that is packable enough; for storage in a closet or for taking with you on a day trip. Adjustability– The seat should come with height as well as position selections for your baby. Style– Lastly, when choosing a doorway jumper for your baby, never forget that beauty is still the spur. Select a doorway jumper color and design that is appealing. Whether or not you think you have the best doorway jumper for baby, always practice good safety while using a doorway jumper. Most of what is listed below as a guideline is general common sense and applies to most baby accessories. When used properly, a doorway jumper is a safe plaything. As is the case with most baby accessories, do not use the doorway jumper near a stairway. Do not attach extra toys to your jumper as these could become a strangulation hazard. In case the height or weight of your baby exceeds the recommended specifications for the jumper, avoid using the jumper immediately. Make it a habit of monitoring you bay while they are in the doorway jumper. The jumper should be placed on a flat object and in a free space. Take your baby out of the doorway jumper if removing it from the doorway. Allows your baby to exercise. May help pre-motor skills develop. Although a baby must be supervised while using the doorway jumper, it does provide the parent with hand free monitoring. Buying a doorway jumper for your baby should be a fun experience for you, because you will literally be adding more fun to the life of you baby. When you educate yourself on the options and safety of baby doorway jumpers you are ensuring a good choice. The following Amazon reviews should be helpful in your search for the best doorway jumper. Hitting the 4.4 Star rating on Amazon, this doorway jumper is economical and provides the basic fundamentals of a doorway jumper. Verdict: The fact that this jumper is easy to transport from room to room makes it one of the best available today. Customer reviews scoring a 4.4 Star rating on Amazon, this doorway jumper has 65 Amazon reviews with 92% of the reviews scoring higher than a 4 Star. Shorter babies struggle to touch the ground. Verdict: With its no-mark clamp, all those looking for a doorway which is both safe and advances hygiene might as well settle for this one. Earning the 4.3 Star rating on Amazon, this doorway jumper comes in a cute blue design perfect for a boy or girl. Verdict: I would say this is one of the best doorway jumper for your baby for the simple reason that it is machine washable for as we know, this is scarcely a perk that comes with most jumpers. Earning the 4.2 Star rating on Amazon, this doorway jumper is the most economical on our list and provides only the very basics of a doorway jumper. Do not fit all doorways with molding. Verdict: The Evenflo Exersaucer tops the list of some of the best doorway jumpers for babies on account of its safety. The fully encased spring is just one of the safety features you will be looking for when choosing this jumper. Earning the 4.5 Star rating on Amazon, this doorway jumper is the highest rated door jumper on our list and also the most expensive. There are no volume controls. Verdict: This one will win the medals because of the non-twist strap features that enable you to move your baby from room to room with ease. First of all, it should be stated that Gracois the leader of manufacturers of baby products that repeatedly are well rounded in the categories of price, safety, and design. For the sake of providing a range of price points, we reviewed one jumper costing much lower than Graco brand jumpers and one jumper costing much higher than Graco brand jumpers. Overall, the Graco is the best doorway jumper for your baby. 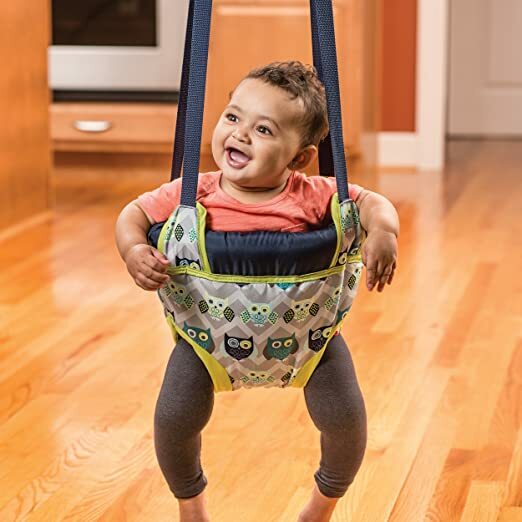 Scoring a 4.4 Star rating on Amazon, this doorway jumper has 65 Amazon reviews with 92% of the reviews scoring higher than a 4 Star.T he Graco bear Trail has an adorable design, toys securely attached and adjusts for a comfortable fit in most doorways. The price is also right, listed moderately in the middle of the other reviewed jumpers.